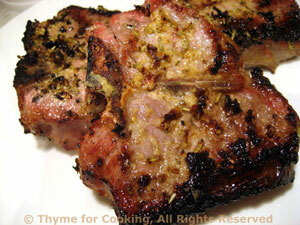 Grilled Lamb Chops Dijon, easy gourmet dinner recipes. Lamb chops are wonderful on the grill, flavored with a bit of fresh rosemary. If they are hard to find, substitute pork chops. Mix oil, garlic powder, rosemary, mustard and brush on both sides of chops. Set aside for 15 minutes. When done to your liking remove from heat and serve. Or you can sauté in non-stick skillet for about the same amount of time - or until done. This near-perfect food of the Incas has slowly been gaining recognition in the culinary world. It cooks quickly and has a nutty flavor that goes with everything. It is normally ready to cook, but if not it will need to be rinsed first. If you can't find it, substitute Basmati or Jasmine Rice. Put quinoa and stock in a small saucepan, cover and bring to a boil. Put quinoa in serving bowl and cover to keep warm. Heat oil in saucepan, add onion, celery, and sauté 7 - 9 minutes, until starting to brown. 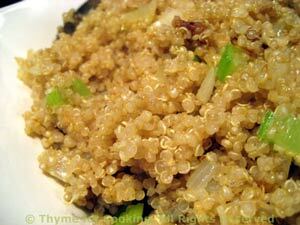 Stir in quinoa, heat through and serve. Sauté onion in oil in small skillet or saucepan. Top and tail beans (cut off the ends...). Cut beans into 1 1/2" (3.75cm) lengths. 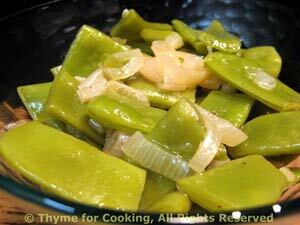 When onion is tender add the beans and chicken stock. Cover and cook over medium heat just until beans are done, 10 - 15 minutes.